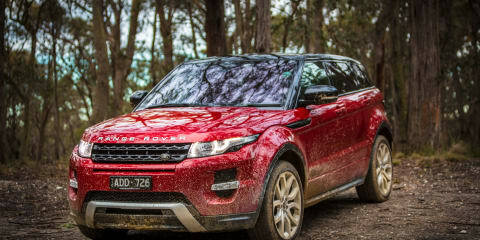 The Land Rover LRX concept released in 2008 was a cut through statement concept car design in a practical body – almost faithfully sent straight to production as the 2011 Range Rover Evoque. Few other production cars of the past decade have absolutely nailed the concept car aesthetic and sheer desirability with quite the same precision. With its large 20” wheels, a chunky squat stance and shallow heavily raked glasshouse – it rocked. After ~30,000kms with my late 2013 Evoque, I have been able to form some views beyond the initial new car smell. I cross shopped a myriad of alternatives; Lexus NX300h (not sporty at all to drive, gutless, noisy, weird interior – horrible), BMW X3 / X4 / 4 series GT (generally excellent handling and drivetrains, meh interiors and exterior styling), Mercedes C250 (‘nice’ – more lux, totally devoid of ‘sport’), Porsche Macan (awesome – but over 12 month wait and realistically $25k+ over a very heavily optioned Evoque – a competitor in size only) and Audi Q5 (nearing replacement, dated interior) among others. If the catwalk runway styling of the Evoque enticed you in to the showroom, be prepared to pay the couture pricing. The entry level models theoretically start around $50k – but that doesn’t even come close to parking one in your driveway. $65k+ is a realistic starting point, escalating rapidly as you explore the lengthy and desirable options list to get the ‘proper’ Range Rover experience that base models lack. My car – a SD4 auto ‘Dynamic’ 5 door – retailed at $74k + on-roads and is fitted with a slightly bonkers $32k+ worth of options (that’s not a typo) excluding LCT which adds a further 30%. So call it $40k + of options. Frankly – many of them should be standard. Retail drive-away price (Vic)? A tick over $121k. No kidding!!! It’s undeniably expensive against almost all rivals. I purchased as a near new LR Australia vehicle, with ~2,500kms, saving tens of thousands off the best deal I could negotiate on a new custom build in an almost identical spec – settling for a diesel instead of my original Si4 petrol model preference. So how can you run up that many extras? All too easily… Metallic paint, contrast black roof, 20″ wheels, adaptive suspension, panoramic roof, blind-spot monitoring, keyless entry, powered tailgate, Tech pack with adaptive xenon headlights, Dynamic Plus Pack (extended leather interior, heated sports seats), Sat nav, rear camera, front parking sensors, 825w premium audio and A/V pack, among other items. This still isn’t even (quite) fully optioned. Colour and trim selections are almost limitless to personalise to your own taste – literally thousands of permutations possible from conservative to Willy Wonka extremes, both inside and out. While I’ve occasionally seen one that’s similar to mine, I’ve never seen one identical yet. So – with its concept car looks and showroom appeal, can it deliver when it hits the bitumen or a rutted dirt track on the weekend? With 20” wheels and (brilliant) adaptive magnetic dampers continually adjusting for the road surface – the ride is well controlled and compliant around town, firm but never jarring. Steering is well weighted, not too light, and with a conveniently tight turning circle. Road imperfections are felt – it’s no magic carpet – but never intrusively so, with a big payoff in handling. The ‘Dynamic’ setting (part of Land Rover’s AWD Terrain Response system) firms up the ride and steering, while the instrument cluster and cabin ambient lighting turns a cool shade of red. ‘Dynamic mode’ particularly shines on smooth winding roads, with tied down body control that all but eliminates roll through bends; quite amazing. It can be deceptive how quickly you are pressing on. This is no cushy barge that feels like driving on tip toes and keels over at the mere sight of a corner. Changing it up to a corrugated dirt road, the suspension attunes instantly – more than acceptable ride quality despite 45 series low profile tyres (Michelin Latitude Sport). Highway cruising is relaxed and quiet, albeit with minor wind rustle from the dumbo sized wing mirrors and some road roar on coarse chip bitumen, a reasonable compromise in specifying those telephone dial rims. The cabin forward view is decent, other than restricted vision around the A pillar (especially at roundabouts), while the rear vision comprises a letterbox slit masquerading as a window – pretty ordinary, but you adapt. Blind-spot monitoring is very effective and well calibrated. It should be standard given such a restricted vision to the side and rear. The driving position is snug, with a high belt line, possessing nothing of the lofty imperiousness of a full size Range Rover or Discovery, entirely in keeping with the nature of the car. The adaptive xenon headlights provide wide and bright illumination at night on highways and country roads and the high beam assist is very effective. The signature LED daytime running lights (standard when Xenons are fitted) are mandatory for the concept car aesthetic – but there are few situations where I would miss the adaptive bendy headlights. It’s fair to say the off road capability is more than I (or most) will need, although I have given it a workout from time to time, the main thing to watch being ground clearance and approach / departure angles. Hardly a consideration for most purchasers I’m sure! The Terrain Response system couldn’t be simpler to use – just dial up the relevant programme on the centre console and it works out the best settings, uphill or down. The 2.2l turbo diesel in the SD4, with 140KW / 420NM torque, is a mixed bag, being very gravelly and gruff when cold. It improves somewhat when warmed up, but overall refinement isn’t strong, with the rattly diesel presence always heard and felt through the cabin. This lack of refinement irks me every time I get behind the wheel. There is also distinct turbo lag from take-off with care needed judging gaps in traffic, although I’ve largely learned to drive around it. The engine is otherwise laid back at cruise with dollops of torque for punchy in gear acceleration (better than 0-100km/h sprint times indicate). For the cost you may reasonably expect more performance, but it’s definitely no slug. I’ve driven the Si4 petrol as well, which seemed best aligned with the vehicle’s sporty nature – that would be my pick. The 6 speed auto relies largely on the wave of torque of the diesel engine, and under most circumstances is unobtrusive. It can on occasion be dim-witted – slow to kick down, and in some certain cases, judders, reluctant to drop a gear probably to maximise fuel efficiency. Sports mode is no better with odd shift points – still lousy to kick down when you give it a boot full and stays in a lower gear than necessary for much of the time, with negligible performance gain. The paddle shifters provide manual control to drop a gear quickly – but it’s a diesel, so that’s not really the point. Fuel economy is unimpressive, certainly well below my expectations (not very important in the overall running costs though). Absolute best achieved has been 6.6l/100kms – but mid 7’s is typical for extended Hume Freeway cruising. My regular urban commute regularly returns in the low to mid 11l/100kms. The interior design, materials and finish (at this trim level) are stunning. ‘Dynamic Plus’ Recaro style single shell sports seats are covered in supple double stitched premium ‘Oxford’ leather, also swathed across most of the doors, fascia panel and dashboard topper. Leather everywhere. It feels and smells properly premium. What looks to be metal is the real deal (although the brushed aluminium on the centre console dents easily from seatbelt buckles). Classy design incorporating plenty of jewellery without being blingy and feels cohesive, even now, five years after release. All the switchgear is easy to reach, well sized and in logical locations (not quite the damped tactility of Audi standards, especially the steering wheel, but still very, very good). A minor annoyance is the small and oddly positioned driver’s footrest to reach a comfortable position, and that a footplate (rather than simply carpet) is an optional extra cost item. It is so many of the little things, beyond the concept aesthetics that lifts the cabin to being special; from the puddle lights located in the wing mirrors projecting an Evoque silhouette on the ground, the rotary gear selector that pops up when the Start button is pushed, the customisable interior ambient lighting with waterfall lighting over the centre console, the jewel like instruments and many of the small convenience features. The sports seats are exceedingly comfortable – well bolstered, widely adjustable (10 way) and beautifully finished (commensurate with their exorbitant price). This cabin, when fitted with the extended leather trim, is a very, very special place to be. Packaging internally is much better than the hunched exterior form suggests – seating four adults very comfortably with decent rear seat head and legroom. The heavy compromise is boot space – it’s definitely more cramped than mid-size rivals – not ‘family size’ lacking in both width (from the large wheel arches) and depth. Would be preferable if the 60:40 rear seats folded fully flat to extend the flexibility of the limited load space but no deal breaker. The panoramic glass roof is enormous; another interior highlight, a signature feature, letting in lots of light, making up for the shallow glasshouse and black headliner, especially rear passengers. It is made of solar glass, with a blackout shade, and haven’t had any issues with excessive heat build-up on hot days (solar windscreen as well). Of all the options, you want the pano roof and I wouldn’t buy an Evoque without it. Lastly, the Meridian 825w surround sound audio system needs highlighting, as it is absolutely STELLAR. Sound is crystal clear, well defined, dials up to ear bleeding volumes without distortion and has thumping bass with a subwoofer beneath the driver’s seat to literally feel the music. It demands the absolute best quality audio source you can feed it. Car audio done right. It’s incredible. The media system works well enough with most of the core features expected (although no DAB+ even as an option) – but has a slow and cluttered interface from the noughties and a central 8” screen with lousy resolution. The screen is a stretch to reach from the driver’s seat, and need to take your eyes off the road when doing so – especially nav inputs which are laboriously S L O W. The nav is particularly poor – lacking traffic, poor routing in inner urban areas and dated unsophisticated graphics. Lastly – the elephant in the room and the biggest fault – build quality. Unforgivable. My vehicle has suffered from a cacophony of rattles, various and repeated electrical gremlins with infotainment / connectivity, cabin and steering wheel switchgear, various trim issues, intermittent clunk in the front suspension, flaking clear coat to an alloy wheel and a tailgate / roof body alignment issue requiring visits to the body shop. The worst fault was the main front wiring loom coming adrift from its fixings and wrapping itself around the front driveshaft, taking it off the road for 3 weeks. On occasion, spare parts haven’t been available, having to be ordered in from the UK. Approximately 30 separate issues (including rattles) at last count from very minor to major – beyond remotely acceptable. Dealer service has always been absolutely first class, beyond reproach – professional and well organised with competent techs and mechanics. Full marks, and an enormous positive for the ownership experience. Most issues have now been fixed. Servicing and running costs are expensive – $800 for a standard 2nd year scheduled service. A two year manufacturer backed extended warranty is ~$2k, which I’ll definitely be taking up. Perhaps a growing pain of LandRover sales, but my local dealer workshop was last time fully booked for 6 weeks solid, so plan ahead for a service – just something to be aware of. 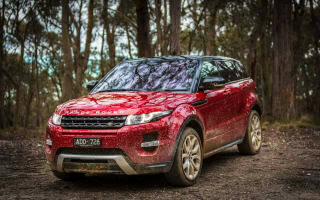 While in for warranty repairs – I’ve had three Evoque loan cars for varying extended periods. All were on standard suspension (not adaptive), two of which had 20” tyres with surprisingly acceptable ride quality – although they didn’t tip in to corners with the same alacrity or deal with poor roads with the same compliance. There is a marked difference between the passive and active suspension setups, although for urban use, the conventionally damped cars are fine. The 18” wheels on the third example traded a modicum of handling ability for a suppler ride, entirely losing its dynamic edge in the process unfortunately. For the two MY15 cars paired with the old 2.2l diesel engine and new 9 speed transmission, fuel economy was massively improved, by perhaps 20% over my 6 speed. Both achieved very low 5l/100kms on the highway, and low to mid 9’s around town – not bad. The 9 speed transmission didn’t noticeably improve drivability. Seemingly improved cabin isolation from the diesel engine in the newer MY15 cars was a small plus. The third vehicle had the new TD180 ‘Ingenium’ diesel engine and felt much lighter to drive, substantially more refined, much less turbo lag and only very slightly lacked a little bit of extra oomph of the old engine. Overall, a significant improvement. The interiors in these lower spec models were a bit plain – ‘premium enough’ without being special. One loaner had standard halogen headlights not much brighter than candles – not recommended. The new infotainment on the MY16 car was massively improved, but responsiveness still slow and laggy, sat nav especially. That same car had a more basic stereo with no CD and thin audio quality – also not recommended. Infuriatingly, ALL vehicles also suffered quality issues including rattles (some better than others), niggly electrical issues, infotainment, trim issues and a one off transmission fault on the MY16 car. As a small representative quality sample, unimpressed. For those considering a purchase; I would cross shop newer competitors (Porsche Macan is by a large margin the ‘best’, although at a dramatically higher price – but also Merc GLC, LR Disco Sport and Jag F-Pace when available), test drive the MY16 facelift diesel with appreciably improved refinement and be careful to sensibly spec your car between available colour / trim combinations and the lengthy options list to maximise resale value. Would I buy one again in the same position? Probably, although the ongoing rattles bug me the most (also common in other premium German brands I’ve driven recently). It is so disappointing this lets it down, given so many other great attributes – the way it looks, the way it drives and the simply lush interior. Despite the lamentable build quality, and not being the most rational choice within its market segment, several years on those concept car looks remain unsurpassed.